How do you organize your living room and keep it organized? Living room organization is simple. Follow these tips and you’ll have a pristine space in no time. Your living room creates a strong statement about you and your home. If yours is saying you are chaotic and disorganized, then read this post. This is a complete guide to living room organization – where to start and how to keep it clean. To start organizing your living room, you really just need to set your mind to it. Always start small. Every mile begins with one step. If you are overwhelmed, there are ways to get organized without stressing out. Let’s go through the exact steps you can take to transform your living room into a pristine and organized space for entertaining and relaxing. The very first thing you need to do is decide the purpose of the living room. This decision will guide the entire organizing process. Will it be for your family to live in? Entertaining only? Who will use it most and how? For example, if it is going to be used to entertain guests exclusively, then you shouldn’t keep personal things like bills or clothes laying around. Go and see her living room. She has it set up explicitly for those purposes and it is pure design perfection. Do you have a separate family room? Some people find success creating a defined space for games and family activities and saving the living room for formal gatherings. But this certainly isn’t true for everyone. Find what works for you. It’s totally possible to have a stunning living room that impresses guests and that you use for actually living in. Before you even touch a single thing in your living room area, organize the drawers and shelves first. You need to have an organized place to store your loose items. You also need to take a mental note (or write it down) about how much space you actually have. If you don’t have enough space to store all the stuff that is laying around your living room, put them into small piles and decide where and how you will store them. Do you need more bins? Do you need to keep them at all? As you organize your drawers and shelves, throw or give away as much as you can. Holding onto too much stuff is what created this mess, so end the cycle here. Next, move to organizing the tops of the counters and tables – basically any horizontal surface in your room. Now that you have some clean drawers – and you know how much will actually fit in them – you can being putting things away. These tips for how to style shelves can help you display sentimental or useful items you’ve decided to keep. Do you really need to keep it? As much as possible, give or throw away as much as you can. Do you need more storage? Make a List! The following step for living room organization is noting how much storage you have and whether you need to invest in more. A notepad or your datebook are perfect places to make these notes as you clean. Take a break and step back. Are there a few things for which you are struggling to find homes? Do not take the easy way out and just stuff them somewhere. Put them in a pile and write down what types of things need storage and then buy storage that is created just for that kind of thing. Buying storage that is designed for which you need it will prevent you from buying a tub that is too large (and a half-empty tub just invites disorganized stuffing). Also, when you store your things in boxes or hanging organizers that fit them perfectly, you will be more likely to find what you need later. No more digging through cardboard boxes. Now that you are well on your way to a completely organized living room, read some of these tips. I bet at least one of them will answer or solve some of the problems you might run into. The habit is all too real. You pick something up, don’t know what to do with it, so you put it in another room to decide later. But this just gives you more work to do later in that room. If you don’t know where to put it, solve the problem immediately. Either give or throw it away, or buy a storage solution for it. If you are crunched for time, you can even put the “I don’t know” things into one box. But make sure you put organizing that box on your calendar’s to-do list. Don’t let it sit there, unorganized. Remember that purpose you decided earlier? Keep it in mind as you clean and organize. When you buy more storage ideas, don’t try to store too much stuff in your living room. If you are running out of room to relax or to use the space how you want, move the stuff to be stored somewhere else. A very common problem in living rooms is poor furniture arrangement. Not having an open area with good traffic flow leads to leaving things out. If it is difficult to get around your living room, it’s just easier to create piles where you are than to get up and put it away. If you don’t know where to start with rearranging your furniture, always use Houzz and Pinterest. They are amazing resources. Houzz even has boards where you can chat with experts and get individual advice. The Spruce has a very thorough and easy-to-follow guide for arranging your furniture. One of the best tips in that list is to create a focal point in your living room. This will depend on the purpose of the living room. Arranging your furniture to achieve your desired use for the room will also encourage you to keep it organized too. How often should you organize your living room? Try to set a schedule to organize your living room once a month or every 6 weeks if possible. Chaos gets worse when you ignore it and things pile on top of each other. Plus, if you stick to a schedule, you will be more likely to actually do it, and it’s easier to manage if you stay on top of the mess. If possible, try to incorporate your storage ideas within your living room decor. If you completely remove all the places you store your stuff, then it will be less likely that you actually put them back. Life gets busy, it’s ok to admit that you need the convenience of storing things in the same room you use it in. Thankfully, there are a ton of absolutely gorgeous pieces of furniture that double as storage solutions. Need some inspiration? Traditional Home has some stunning examples of furniture that can double as storage. You might consider built-in-bookshelves, ottomans, or coffee tables with multiple shelves. Of course no time like the present, but there are actually optimal times of the year that are better for organizing your living room than others. The best times to organize your living room is right before or after a major season change. You are already changing from one season to the next, so it’s the perfect time to rethink your main living room too. We have shared this before but in a different way. 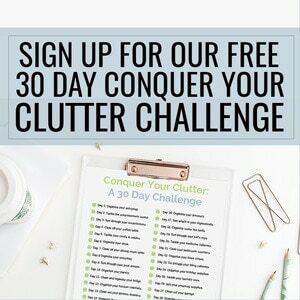 Go read about how to create a year-round de-cluttering routine for your home. The key is to split it up into seasons. Spring cleaning is one of the best times ever to go through and totally reorganize your living room. The sunshine is warming up, your decor will change from snowflakes to flowers. It’s time to refresh and renew your space, just like the outside is growing with new life. Do you like printables? Housewife How To’s has a very handy living room spring cleaning checklist. They even explain in detail which areas to clean first to really obtain a sparkling clean room. Even if you don’t have any children, the start of a new school year can be felt. It’s like the middle of the year offers a brand new chance to refocus and set new goals. Take the end of summer and beginning of fall as a chance to evaluate the purpose of your living room and make sure it is working for you. This is a very popular time to purge and clean. After you receive all your gifts and put away all the decorations, you are left with a bunch of cleaning. The best part? Stores know this is a popular time of year for organizing. 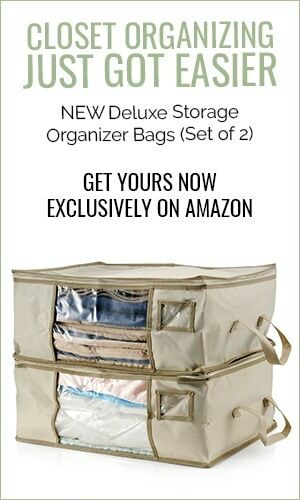 Storage bins and organizers tend to go on sale right around this time. Take the opportunity to buy what you need and save money. Now that you have a perfectly organized living room, stand back and enjoy it! Throw a party, invite guests over. Use it the way you want to use it. You deserve the reward. Keeping it this organized can really be pretty simple. Here are the most essential tips you’ll ever need for keeping your living room organized for good. To make a successful change to a cleaner living room, you must make it a lifestyle choice. 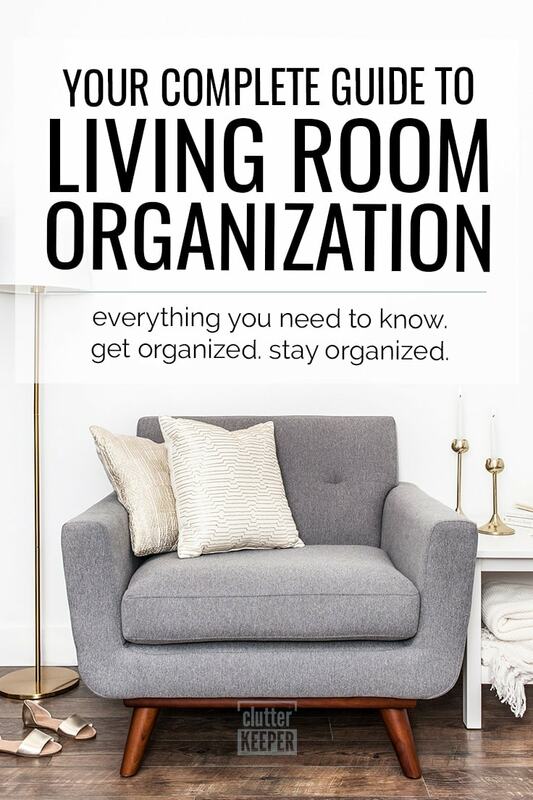 Simply adding “organize your living room” on your to-do list makes it something you won’t want to put off. Look around your organized living room. This is what you deserve to live in. This is how clean and tidy you want to keep it. Small habits like putting away something that you got out, will prevent it from returning to the chaotic mess it was before. Every once in awhile, you will need to evaluate your current storage solutions. Are they still solving your problems, or are you growing out of them? Maybe you are collecting too many books that can’t fit easily on your bookshelf. Or maybe your blanket chest is too full of blankets to fit any more. Go through the stuff you are storing and decide if you need to keep everything. Only storing what you have room to keep is the best way to prevent a messy home. If you honestly must keep everything you have but you still don’t have room for it, then consider purchasing more tubs or hollow ottomans. Find some creative storage solutions that work for you. One thing you should definitely consider is a hanging organizer! It fits easily inside your closet. You can keep any number of small things inside it – like perhaps winter gloves and hats. Finally, the best way to make sure your living room stays organized is to admit why it kept getting unorganized in the first place. If you are simply too busy, find some time-saving hacks. Change how you look at organizing so it can be accomplished easier. Maybe you just don’t enjoy cleaning or putting things away, or you think you like it messy. Try to find ways to maintain your things so you can still use the living room for what you want. No matter what your hangup is, there is a solution, and you can maintain a clean space. It is possible. Congratulations! You are well on your way to creating and maintaining a clean living room perfect for entertaining guests or spending movie nights with your family. Learning how to organize your living room is simple when you have the best tools. Now that you have an organized living room, here are some more tips for helping you organize your entire home. 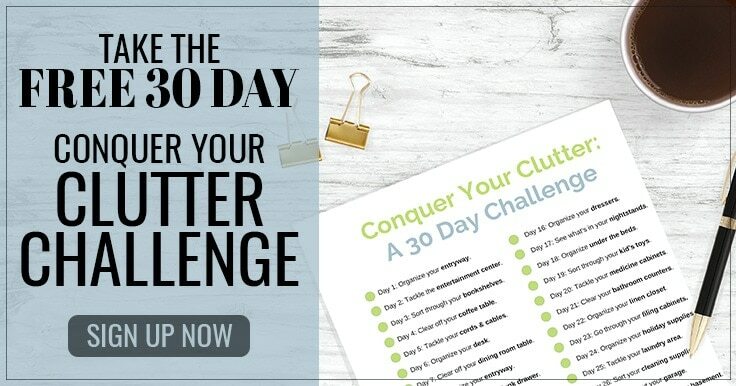 3o Day Conquer Your Clutter Challenge – Get a completely organized home in just 15 minutes a day! Kitchen Organization Ideas – Find guides and tips for organizing your kitchen and pantry. Bedroom Organization Tips – Create a peaceful place you can relax with these ideas.